Efficient communication doesn’t come naturally! We recognize the problems of communicating across differences of time, culture, geography, and organizational boundaries – but one of the biggest divides are between the young and the old in the same workforce. The young are much more accepting of new technologies. Sometimes these can really solve communication problems, but the benefits have to be balanced against the disruption of having too many products to learn and too many places to check for information. People just aren’t very good at putting themselves in each others’ shoes. Our dream is an aid that advises us about the best way to communicate what we want to say. Really good choices are subtle – think of how much the time of day matters in the choice between email and telephone. However, simple things like taking into account whether a worker is nomadic or desk-based, and what tools they like to use, would be a good start. People are very image-oriented – even just putting photos of people next to things that come from them can help communication be more effective. Tools are still very influenced by the “phone and typewriter” era. We expect sound and video to play a bigger role in our organizations in future and to be more integrated with other sources of information, just as they are already feature in entertainment and social media platforms on the web. We use a wide range of communication tools in our work lives – everything from Skype to room videoconferencing and team collaboration platforms – but it’s clear email is still our biggest problem. There’s far too much of it, and most of it isn’t even really intended to tell us anything we need to know. The real communication gets lost in all the noise. People use email because it is the easiest way to get things off their desks that leaves a trace to show “the job’s been done”. We need to coax people away from email and into ways of communicating that are more efficient. New technologies like mobile telephony and video messaging help with this, but they can’t give that same feeling of conclusion until they leave searchable traces. How do we want to search our memories? Organizations think they understand how they are structured – but in this time of rapid change, these structures change rapidly, too. We don’t remember where information is stored, we just need to find it. More than anything else, we value being able to search every source we have all together – emails, documents, intranets, and, where they exist, multimedia recordings – using semantic keywords that find not just the words we specify, but related words too. Sometimes we want to search for something specific, but there’s a role for serendipitous discovery. 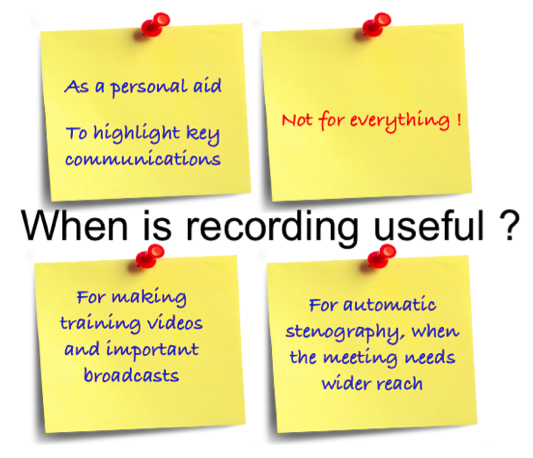 Although audio and video recording aren’t suitable for every meeting we have, they do have a role to play in helping us find information we didn’t write down, and in broadcasting the things people really need to know. 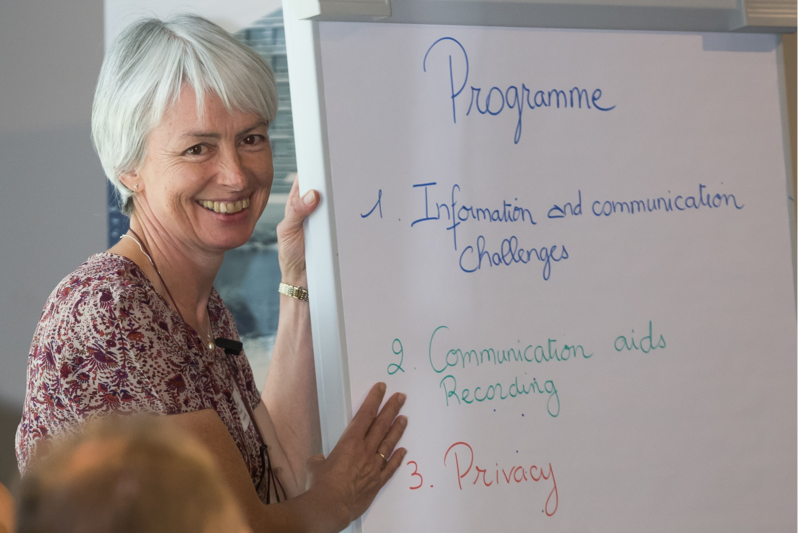 Although freer forms of search are more important to us, we do still need information to be structured in our traditional corporate categories such as products and regions – but it might be useful for both the participants and the archive if those attending meetings agreed the category codes at the end. Customization will be important both to convey an organization’s structures and to suit its users. Like for any new system, the design should be guided by what behaviour change we hope to facilitate when we deploy the system. Privacy is important in business communications just as in the rest of life. It is only right to record if the benefits outweigh the privacy violation – for the people who are actually concerned. In business, that depends on the state of the organization! ✦ when there are more serious problems, people value having what they say “on the record” – in email traces and recordings – but make only guarded statements. Trust is also important when it comes to the vendor of communication aids, particularly where recording is involved. Companies are taking big risks if their communication goes wrong or ends up in the wrong hands. 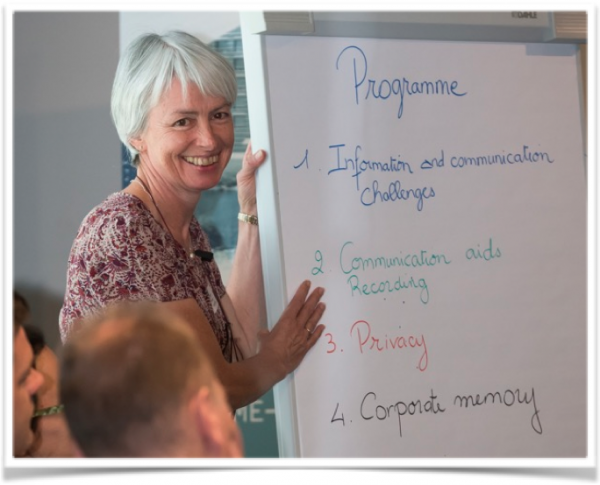 Workshop facilitation: Jean Ducommun, Monique Divanach, www.km-consulting.ch . Acknowledgements: This work was supported by the European Union under the FP7 project inEvent (grant agreement 287872). We would also like to thank all the participants! More about the inEvent project.